A strong woman, a hard worker… my mind said that. But I can’t describe my feeling when I see this woman for the first time; sad… or … admire her strength? Last weekend, I visited my father in-law in Bumiayu, Central Java, Indonesia. That time, I was having breakfast with my husband at a small restaurant. From the restaurant, I can see the small river flowing under-not far away. 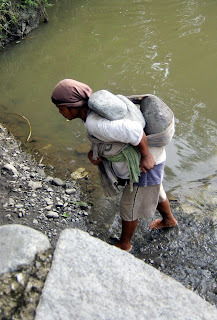 She’s doing this- a very tough job- only for surviving; to fulfill her family needs. Maybe she doesn’t have another skill or opportunity to have another job. The question is: till when she can do this?